My travel buddy Durward is joining me on my next trip to India. While I’ve had the opportunity to visit Bangalore many times, this is his first trip to India. I’ve been collecting some tips and thought I’d share them. Please note, this is not a travel list for all of India, rather more specifically for those working for American companies that have an office in Bangalore. Bangalore used to have a terrible airport. It was an old military airport and was very difficult to deal with. Fortunately, there’s a new airport outside the city and each year it seems to get better. However, here are some tips to make this more efficient. While the customs process has improved tremendously, it can still be a bit frustrating. When entering India do not mention anything remotely similar to working if you have a tourist visa. Business visas also limit what you are able to do while in India. You should review this with your company’s travel/legal team to make sure you don’t say the wrong thing. There will be a few drivers with signs inside the airport, just outside the customs. Don’t be alarmed if you don’t see your name. The majority of drivers are going to be outside waiting for you. I made this mistake on my first trip to India. There’s a new elevated freeway that will take you quickly from the airport to MG Road area. This should take about 30-40 minutes when you arrive late at night. Always carry a printed copy of your flight information when you visit the airport. You will not be allowed into the airport lobby until you can prove you have a flight taking off within a few hours. There will be people offering to carry your bags on a cart from the taxi to the airline ticket counter. In general, this is a good idea. They’ll get you past the crowds and to your gates quickly and there’s a set fee. The chai carts on the first level are better than the ones in the gate area. When leaving India, make sure you ask the customs agent to tag your carry on luggage. This will be needed later in security. Don’t be surprised by the multiple stages of going through immigration and customs as you leave India. Be patient, give yourself ample time, and you’ll get through it. You may not know what happened, but you’ll soon be past security and ready to peruse the gift shops. You need to bring a pair of sandals and/or slip on shoes for visiting temples. You can’t wear shoes inside and you want something that can be slipped on/off easily. You also want them to be comfortable and not flashy. Use these collapsing packing cubes for shirts and such. Non-collapsing packing cubes make travel and living in hotels much nicer. Most hotels will have outlets that work with US equipment. However, there may not be an appropriate outlet next to the bed. So check to see if your CPAP or similar devices work on 220 and you should get an adapter. Pack extra shirts. India can be humid, rainy, and a combination of both. You may find yourself changing shirts throughout the day. Your hotel should also provide great laundry service and your company should allow you to expense this. It’s better than over-packing. Condoms and such are easier to pack than purchase in many countries, just saying. Are you planning to explore India or just go to work every day? If you plan to explore, you should have some mosquito spray and sun tan lotion. Leave room in your luggage for souvenirs. You will be bringing home more than you expected. 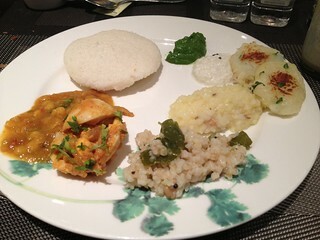 I’m a vegetarian, so I love eating in India. Everyone will have their advice for surviving India without getting Gandhi’s revenge. Personally, I have an iron stomach, so this has not been a problem for me. Stick to vegetarian food. You are in a country that makes amazing vegetarian food. Embrace this change in pace and avoid eating meat. It’s also the best way to avoid picking up surprises. Eat biryani, a rice dish, regularly. Rice is good for keeping you firm, if you know what I mean. It’s also delicious and low fat. Try the Dal Makhani. This slow cooked lentil dish is smoky, smooth, and you will never get it in the US with the same flavor complexity. I wish I had discovered this earlier. It’s also great when you need a break from spicy food. I love spicy food, but try some Navratan korma when you need something with less heat. For god’s sake, don’t eat that horrible English breakfast served at every hotel’s buffet. You’re in India! Walk past the grey food and grab something new. Hotels and restaurants will serve you plenty of bottled water, you won’t need to ask for it. Hotels should have filtered water, you can ask if you are worried about getting the squirts. If you really, really, really need to eat meat… stick to your hotel or have your colleagues take you to a good place. Remember: lamb is actually mutton and don’t ask for beef or pork. That leaves you with chicken or fish and Bangalore is a landlocked city so the fish may not be fresh. My favorite Indian dessert is Gajar Halwa (carrot pudding). It’s another dish that is a million times better in India than your local curry shop. Bangalore is a rapidly growing city. Unfortunately, its growth has not accounted for proper infrastructure. Traffic is horrible and you won’t be able to nonchalantly skip down to a theater. You will probably have to stay within your hotel’s neighborhood. With some planning, here are some places I’ve enjoyed visiting. Remember to wear pants and shoes that can be easily removed when visiting temples. 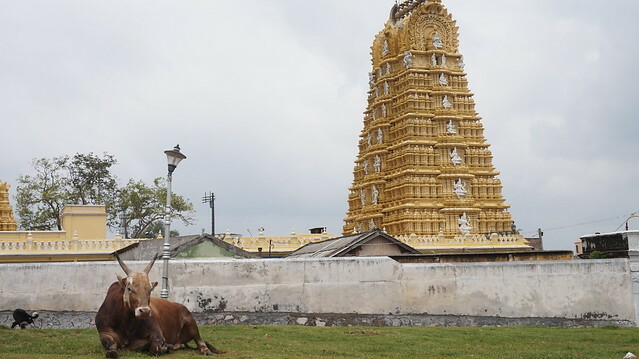 The Bull (Nandi) Temple is Bangalore’s most popular temple. Your driver can take you there and guide you around the small park area. You can take photographs inside, but bring some rupees to share inside the temple. Neighborhood temples: Each neighborhood in Bangalore has a variety of temples. I have found these smaller temples to be more interesting and inviting that some of the larger, famous temples. Sri Lanka is only a 90 minute flight from Bangalore and is a peaceful oasis from the hustle and bustle of India. It’s also very affordable, the people are lovely, there’s an amazing elephant sanctuary, and the country is currently peaceful. Sri Lanka is a Buddhist country and has beautiful temples. But remember to be respectful of Buddha statues at all times. Commercial street is where locals go to shop. It’s a bustling grid of narrow streets filled with clothing shops, jewelry, and more. I like to visit a couple small stores that sell art supplies and spices. There’s also a popular place to buy Indian sweets before heading home. You’ll need to have your driver drop you off and then arrange for a place for him to pick you up. The driver will not be able to park within the area and join you. While I’ve never had a problem, I keep vigilant for pickpockets in this area. There’s an animal safari outside Bangalore. This is a zoo where you get into a school bus and it goes off roading through areas filled with lions, tigers, bears, and more. It’s not the World Famous San Diego Zoo, but is worth checking out if you want to get out of the city on a weekend. It also has a crazy looking amusement park next door. 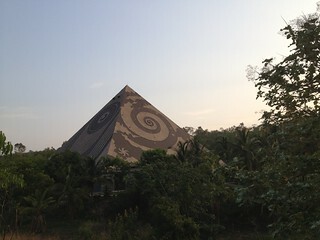 If you meditate, Pyramid Valley was built to provide the best meditation possible. I don’t meditate, but entering this building will have an impact on your energy. It’s not on the tourist map, so don’t be surprised if you are the only American in the area. Walking in Bangalore is difficult. The sidewalks are an obstacle course and you’ll be asked every 50 yards by an auto-rickshaw if you need a ride. They can be persistent, so just keep saying “Thank you but I am on a walk”. Just remember that it’s rare to see an American strolling through the city. You will be able to find a movie theater near your hotel. Check to see if it is a luxury theater where you can reserve a seat. You probably won’t find a performance theater to watch a concert, play, or dance. KR Market(aka Central Market) is a great place to visit if you enjoy visiting local markets. Check out the main building filled with flower markets. Ghandi market area is not that exciting. Mysore is a great one day trip. You could have your driver pick you up at the hotel in the morning and come back that evening. While in Mysore, check out the area where they tortured prisoners by chaining them to walls and then letting water into the chamber up to their shoulders. They’d stand there for days while fish ate their flesh. It’s the creepiest place I’ve visited. The palace and mountain top temples are also fantastic.